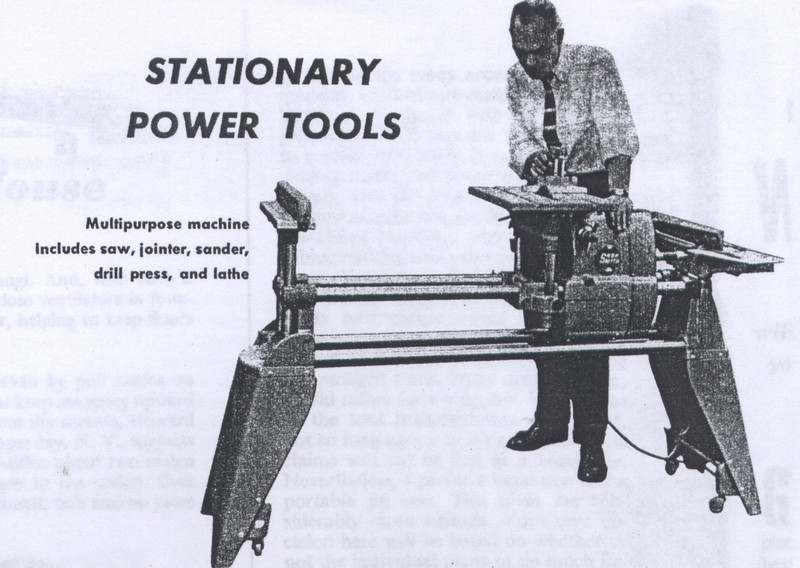 The radial arm saw -- Delta, DeWalt, Sears, Montgomery-Ward all sold variations of these power tools in the 1950s, even into the 1960s, before several factors caused a decline. These machines began appearing just after VE day in 1945, as the champion of the RAS, Wallace Kunkel, proclaims . And the Shopsmith is another combination tool --by now the Shopsmith 10ER -- is widely purchased. In a weekly TV program, the Chicago-based woodworking teacher, Walter ("Walt") E Durbahn, demonstrated tools and projects to wannabe woodworkers in the Chicago area. It's difficult to keep away from technical jargon in talking about stationary power tools, but let's take a brief look at the most popular units. If you are lim­ited in what you can spend for the gift, if he is mostly an occasional hobbyist, or if he has only a relatively small area for his workshop, then look into the multi-purpose machines which incorporate sev­eral different tools on a single stand, powered by one motor. These multipurpose machines, fre­quently combining all, or most, of the features of a table saw, jointer, drill press, lathe, sander, jig and band saw, are often looked upon as a transitional unit, a step forward from hand-tool to power-tool operations. But many owners — especially since the recent introduction of a new kind of setup, in which an in­genious quick-attach motor mounting permits switching the motor from one machine to another and hooking it up in a matter of seconds — look no farther. And their contentment is understandable. I have used such a combination machine for years in my Walt's Workshop TV program to show its versatility and ease of operation. But if space is available, if you are not restricted financially, and if the woodworking hobby is deeply ingrained, then I suggest that you talk with your husband — or son, or brother; or father — about his specific preferences in individual machines. This link takes you to a December article in a 1954 issue of American Magazine; during 1954, almost every month Durbahn wrote an article on woodworking and/or "how-to-do-it" for an eager audience of new home-owners. read, for example, his inspirational piece on both "do-it-yourself" projects and inducements for Americans -- men, especially -- to take up woodworking in 1954 issues of American Magazine. As well, during his career as industrial arts teacher, Durbahn wrote for a variety of other national magazines. I'm a Chicagoan born in 1947 …. I remember watching Walt's Workshop on Channel 5. If memory serves me, it was shown on Saturday mornings. The sponsor was a local lumber yard chain, Edward Hines. I don't remember much of the content, but I do remember enjoying the show even then.